We often think of Jesus as someone with all the answers. But over and over in scripture, he asks questions, seeking to engage with people and genuinely interested in their responses. 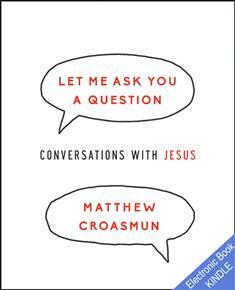 Matthew Croasmun challenges readers to consider this book as an experiment—an opportunity to see whether God is real. He invites us to enter into conversation with Jesus by answering the questions Jesus asks in scripture. The goal is not to come up with what we think are the right answers but to respond honestly to Jesus' questions. Space for you to continue the conversation with Jesus. Written in a warm, encouraging style, this thought-provoking and imaginative book will certainly give readers entry points into conversation with God, and they may find themselves experiencing a deeper relationship with the divine than they ever thought possible.